Discussion in 'DIY' started by MasonJar, Dec 23, 2018. I have been lurking for a couple weeks here mainly looking at the threads about DIY Induction Heaters. I finally decided to build one after getting my hands on a $2 wood box I found on the local Dollarama store. 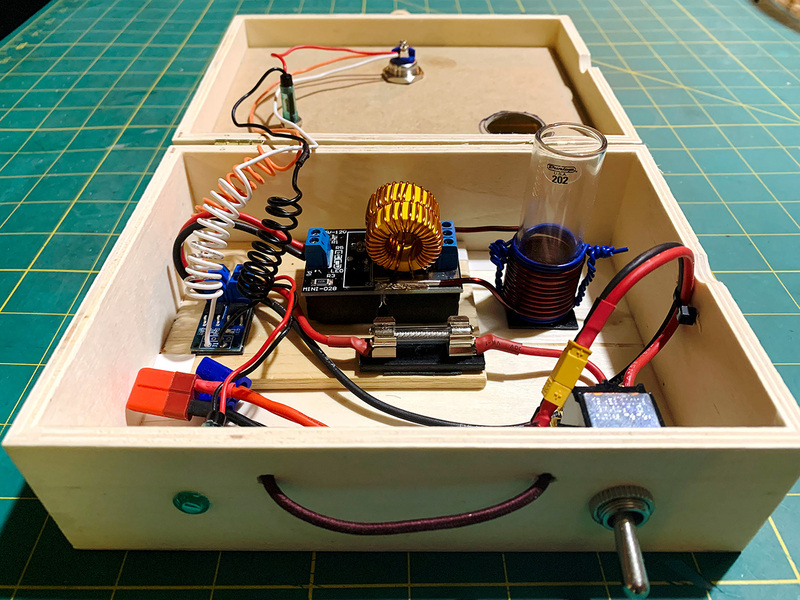 First of all, thanks to @Pipes for posting lots of info and pics in his Induction Heater thread. 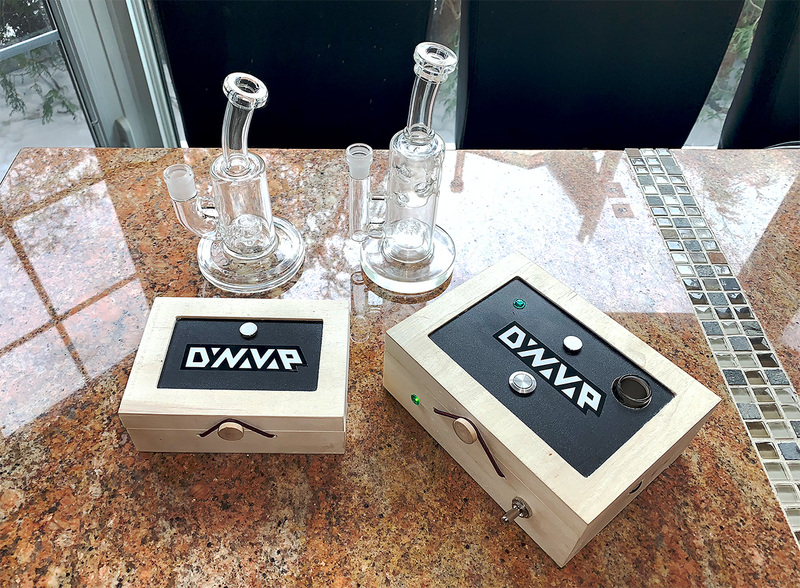 I was also able to get ideas/schematics from the /r/vaporents and /r/dynavap subreddits. The parts... The wood box was from dollarama. Most of the electronics parts excluding the fuse and the fuse holder were from Amazon. The fuse and holder are from a local electronic store. I am using a 15A 30V fuse... I might downgrade this to 12A fuse when I find the time to drop by the electronic store one of these days. 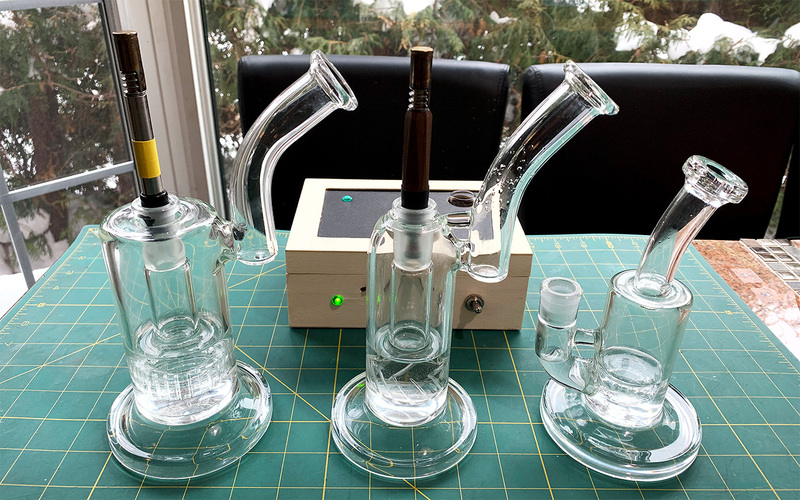 I believe 12A is probably the max draw when heating the vapcap. I decided to use two switches... One toggle switch to activate the Lipo battery and a Momentary switch to activate the IH Circuit. I must say using this IH is much more convenient than using a torch to heat up the VapCap. It takes anywhere from 6 to 8 seconds to hear the clicks. 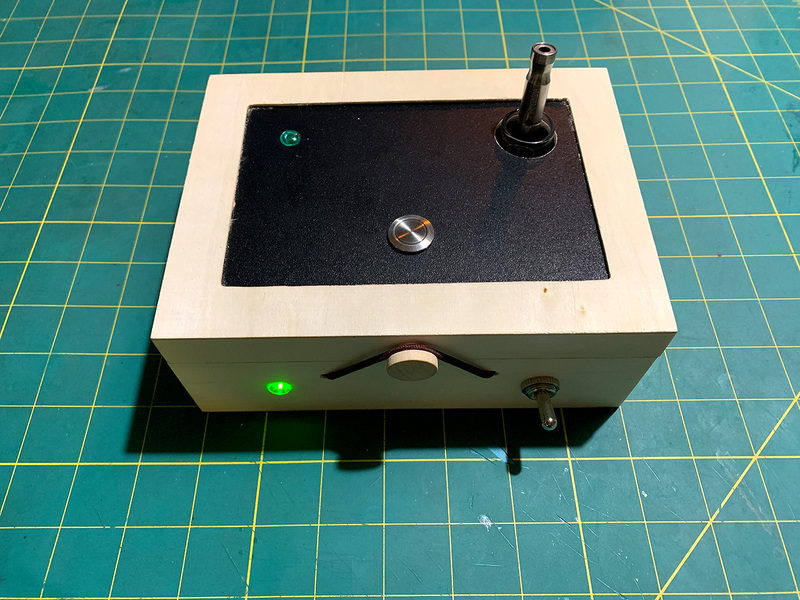 One enhancement I can think of right now is a magnet on the top panel to hold the vapcap. Another is to replace the black panel on top with acrylic so the internals are visible. There are also LED lights that turn on the FET switcher and the IM board when activated. rand_alpha86, Madri-Gal, lazylathe and 3 others like this. None of your images are showing. Very nice. How about a shot of the inside. EDIT: I found the problem with the pics... Hopefully you can see them now. Yes it is lol... I thought it was a nice touch for a $2 box. Imgur doesn’t work in this unfortunately. Nice. You even fused the power line. Very nice. Thanks! I decided to fuse it after the first IH that I was playing with broke and almost melted the wires on the alligator clips I was using that connected it to the Lipo battery. 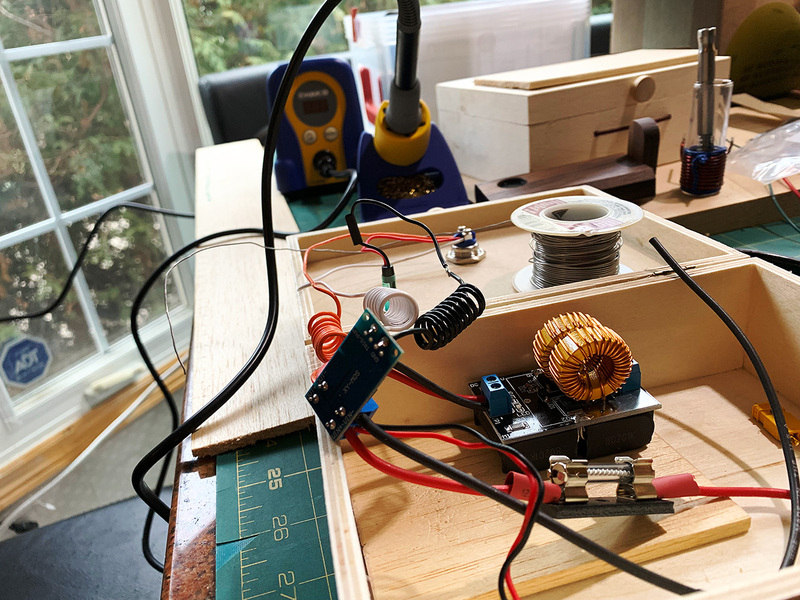 During the test I was not using the FET Trigger Switch Board and was just connecting the lipo directly to the IH module with alligator clips. That probably contributed to its early demise. However, instead of failing with an open circuit, it shorted out the wires hence the fuse just to be on the safe side. It is rated 15A currently, I will replace it with a 12A and then a 10A so it can blow faster at the event of trouble. Definitely glad you added a fuse. No protection from batteries capable of delivering 30+ amps can cause lots of fireworks. As you found out, the weakest wire(s) will burn up. Can be pretty scary indeed as can happen so quickly. Gets really fun if no wires are weak... The battery itself will give if nothing else does. A simple fuse will protect from disaster but doesn't give your battery protection from draining too far. You may want to incorporate a 10 amp BMS in place of that fuse. Driving these batteries till they drop off themselves isn't good for them at all and will rob you of charge cycles. Play safe and most of all have fun doing it! Keep us posted. Buildozer, MasonJar, YaMon and 1 other person like this. I recommend imgbb for image hosting it works very well and images will be displayed here clearly in full-size for all to see and once you have registered and learnt the procedure it's actually very quick and easy much better than imgur I find. Welcome to the forum @MasonJar and the best of luck with your project. I intented to build a IH myself and also run into the problem with burning wires (they were too thin). Once I find more free time I will try again. Which kind of LED did you use? Voltage? And which voltage should I choose for the power switch? Thanks again Pipes! I definitely will look into the BMS module you linked to... 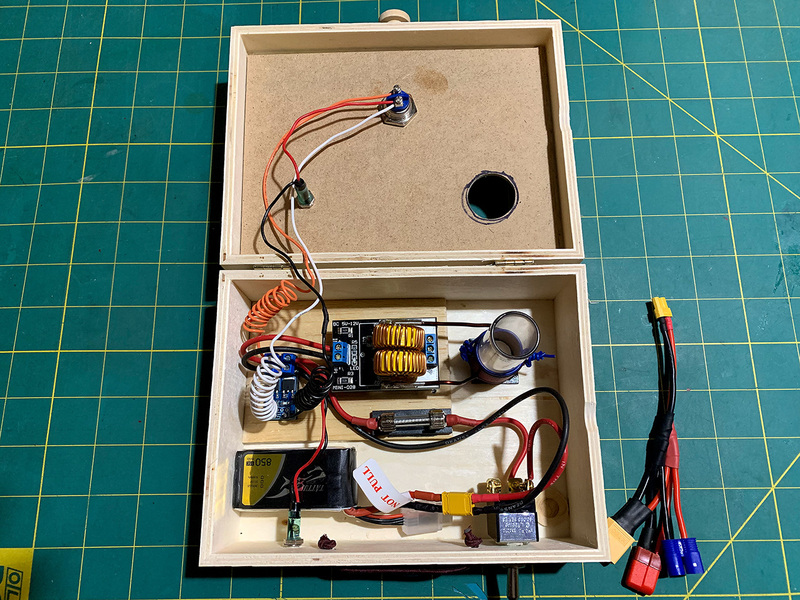 I might need to get and mod a 3S balance wire to get it to work with lipos as it seem you need to connect the individual cells to the module for the regulation/protection to work. I am well versed with caring for/respecting lipos as I fly RC helicopters powered by these. I've seen these babies puff or worse when over discharged at a very high rate and/or burn after getting damaged after a crash. For the IH module I am only balance charging the lipos to storage voltage (50% total capacity, or ~3.85 volts per cell or 11.55 volts total). I recharge them as soon as the voltage drops to around 40% capacity. 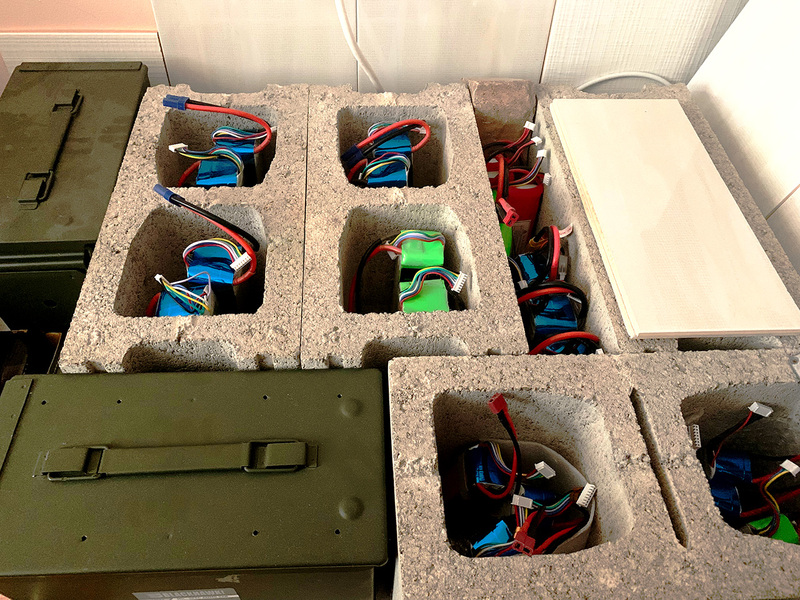 Incidentally, I store all my lipos at storage voltage (~50%, 3.85V per cell) in a lipo bunker... You need to take precautions with these lipos. These cell checkers are available at stores that sell RC helicopters, drones and probably at Amazon, Banggood, or Ali Express too. I bought the momentary switch without LED from Amazon as I needed it delivered asap. The LED I used are rated at 12V DC and have a built in resistor inside them (probably to step down voltage even more)... I got these from a local electronic store. The switch you linked to is a "latching" switch as opposed to a "momentary" switch. That switch (latching) is suitable as a toggle switch to enable the battery like the toggle switch I have in the front panel of my build. HOWEVER, I suggest a momentary switch to actually power on the IH Module... The momentary switch only engages the IH via the FET Trigger board when you hold/press on it. It cuts power as soon as you stop depressing it. This ensures you don't forget the IH powered on... Very important for safety reasons IMHO. 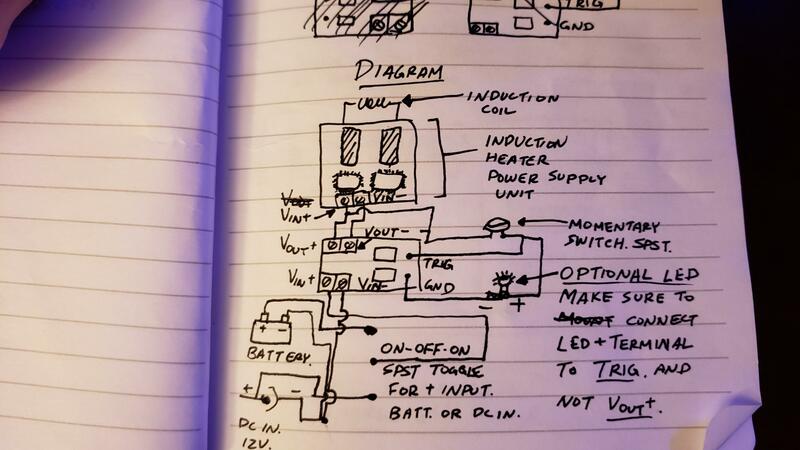 Having the LED built in the switch means you can forgo the individual LEDs like in my build as you can wire the built-in LEDs instead. Madri-Gal and Phenix like this. I added a tie wrap to secure the silicone cable and provide strain relief to the + wire screwed and soldered on the toggle switch... The fuse is rated at 15A 30V DC and appears to be "spring" loaded to prevent arcing when it blows. Momentary switch need to be pressed to activate the IH module. It takes anywhere from 6 to 9 seconds to hear the vapcap click(s). Buildozer, Madri-Gal, GtrBob and 1 other person like this. Thanks for the detailed expiation and your suggestions @MasonJar ! Made it easy and more clear to understand. I am reading this post right now. Cool stuff. Challenging to understand for me cuz too less knowledge. Good luck on your project@Phenix. 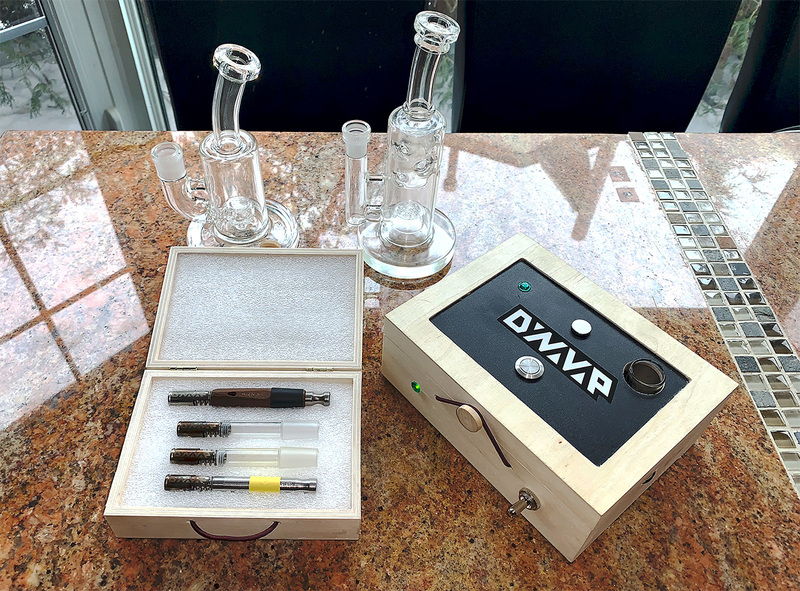 There definitely is a lot of info on this site on how to successfully build an IH for the dynavap. Maybe consider adding in a volt meter to measure cell voltage or a voltage cutoff circuit, to protect battery some more. Madri-Gal and MasonJar like this. Thanks! I got a smaller box which I now use to house my vapcaps... I also added a sticker and a magnet to the IH. 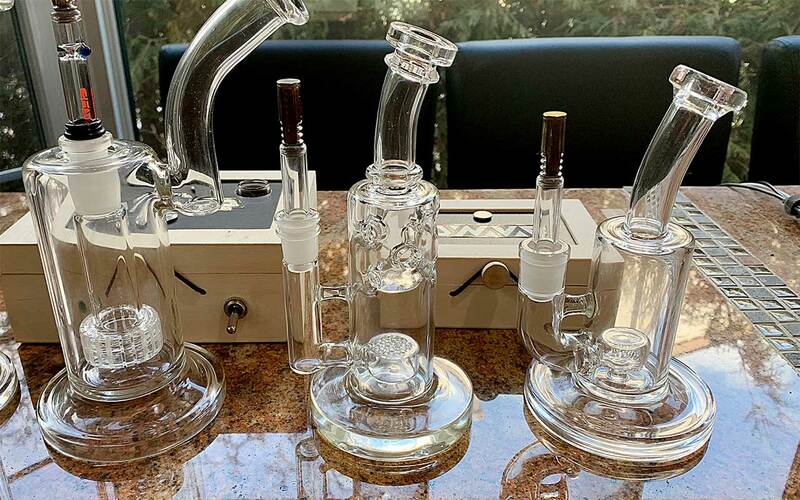 Below is how it looks now... Also shown are the two bongs I mostly use with the vapcaps nowadays. I have also been mostly using Ddavemods Water Wand V2s with Ti Tips... I prefer these to the OmniVong XL especially when used in bongs. 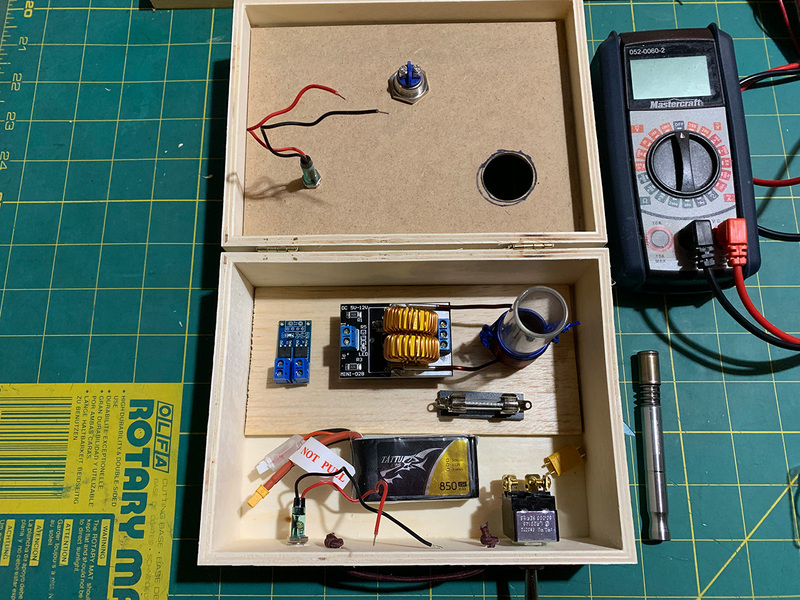 The bigger box definitely has space if you want to add a voltmeter... I have cell checkers that measure voltages of lipos every time I use them, or in this case, before I use them on the IH. 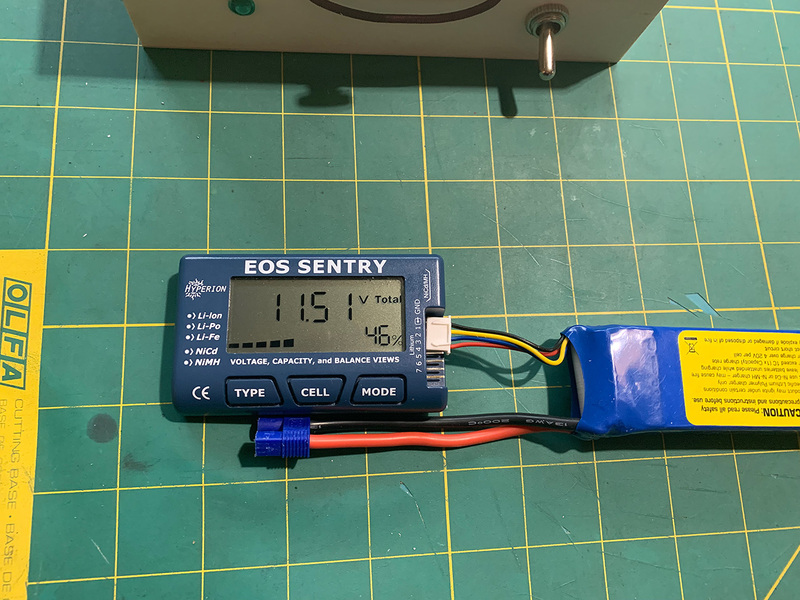 These cell checkers shows not only the total voltage of the lipo but also the difference between the max and the min voltages among the various cells. 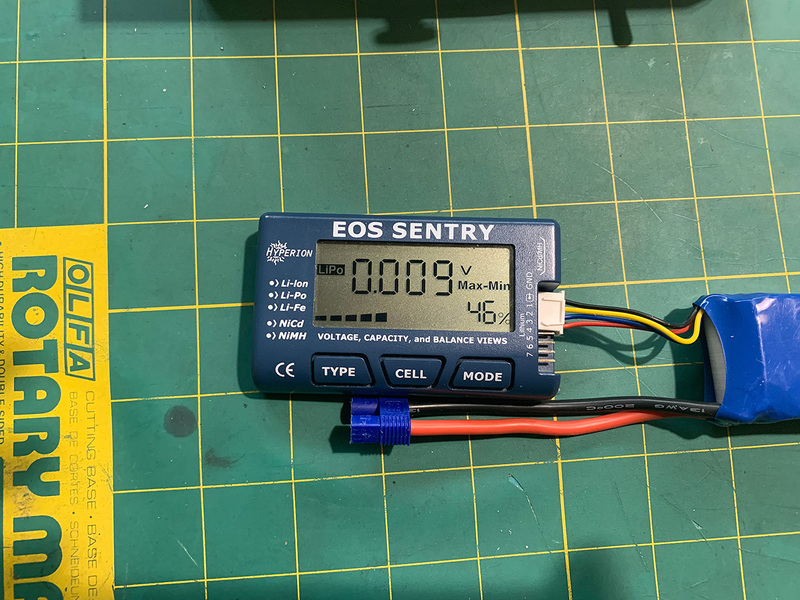 When used on high discharge applications (like on RC drones and helis), it is recommended that the cells be as close in voltages to each other both before and after use... Preferably less than 0.1 volts difference between the highest and lowest cell voltage. 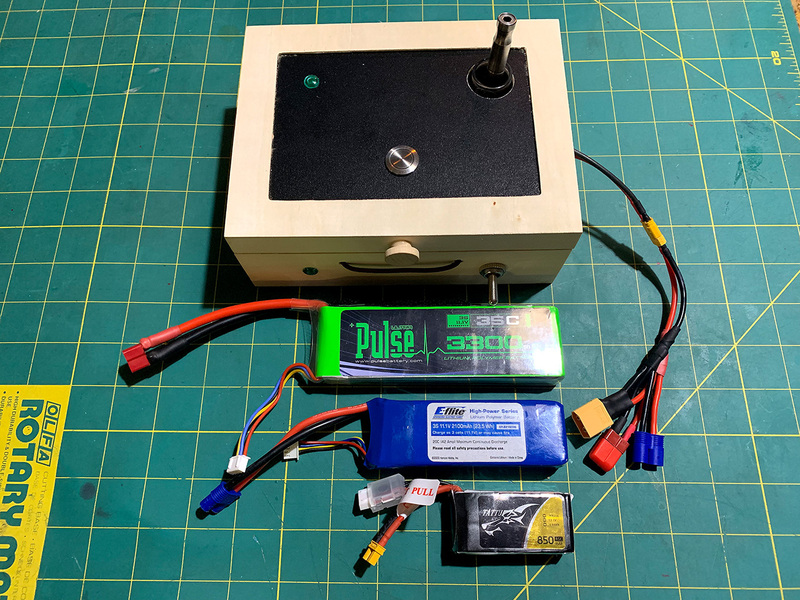 Lipo cell checker... Total battery voltage... I typically store lipos at around 50% voltage... 46% in this case. Buildozer, Madri-Gal, Petrolhead_GR and 2 others like this. That's a cool storage box too. You've got some mad skills there to make things look like they're store bought! MasonJar and Madri-Gal like this. Thanks! Vaping has become another hobby for me. I should have gotten at least another one of those smaller boxes... I went back to the Dollar Store and they are all gone. 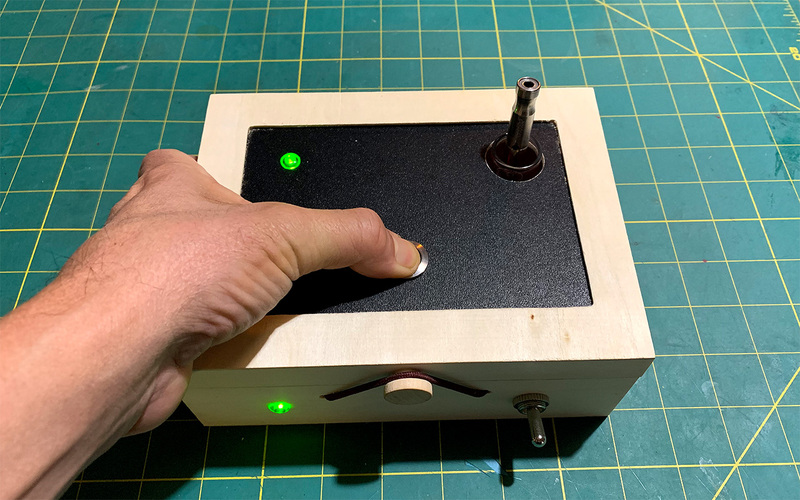 The ZDS induction heater fits on the small box if you put it on its side. When I find the smaller box I will build another IH... for portable use.